1 – Termites do a lot of damage! They can cause up to 5 billion! (yes, billion!) dollars in damage each year to American homes. That means, termites cause more damage than fires and tornados combined. Part of this is because they are survivors and reproduce really quickly. 2 – The weight of all the termites in the world surpasses the weight of all humans in the world combined! An important note is that their queen can produce 2000 eggs per day, and adding that to their lifetime of about 15 years give or take, one of them can make up to 10 million eggs per life. That’s really a gigantic amount compared to chickens that only lay between 150 and 300 eggs each year. With this information, it’s scary to think how many termites are in Arizona, especially all around the world. 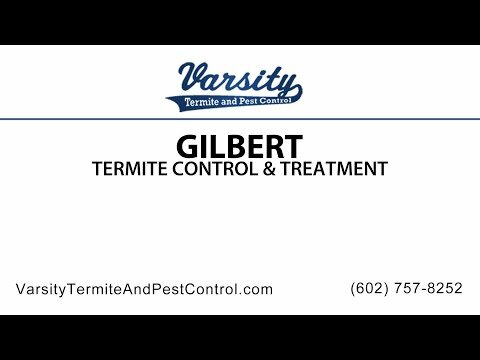 We, Varsity Termite and Pest Control, specialize in termite control in Gilbert, so if you ever need our assistance or you want to ask some questions, don’t hesitate to reach us. 3 – Termites have been around since the time of dinosaurs! Surprisingly, I am not lying about this. Termites have been living in this world for over 100 million years, sharing a common ancestor with cockroaches and mantis (also a reason why termites can be really disgusting for some people). 4 – Some types of termites are blind! Since they like to live underground and in dark environments, there were no need to develop eye vision through the ages. Even if they don’t have any, they can still sense you coming! If you feel you have a possible infestation of termites in your property, go ahead and contact us. We will do a thoroughly termite inspection to your home and check if you need any termite treatment. 5 – Termites can’t handle the sunlight! Through the times, these little creatures are so used to living in dark spaces and underground levels that they can actually die if they expose themselves long enough to the sun. This is one of the main reasons they can only explore the world at night; you won´t encounter many termites in the day. The next fact will freak you out a little. 6 – Termites have to eat feces after they are born! I can understand how no reader was expecting a fact like this, but there is a really good reason for it. When they start living, they don’t have enough bacteria they need inside of them so they have to do a practice called trophallaxis, which is the act of eating each other feces. Also, since they molt, they have to resupply after doing it, making trophallaxis a big part of a termite’s lifestyle inside their nests. 7 – Termites are really clean! They really spend a good amount of time grooming each other, making an enormous effort to stay impeccable. You would think of them as one of the dirtiest insects on earth because, you know, they live under the dirt. In fact, this is important for their survival as this keeps parasites and harmful bacteria in check. 8 – Queen and Kings can actually fly! Yes, both of them can fly, at least the new reproductive ones. When they are young, they leave their nests in swarms to look for a mate for termite reproduction, making this the main reason why only them have actual eye vision. After they find a partner, they look for a new place to start a colony and once they settle down and break their wings off, they start to raise their new workers and soldiers. 9 – When soldiers detect a nearby threat, they send a signal to their home! As soon as they feel something dangerous coming to their nest, their soldiers bash their head against the walls to send vibrations through the wall, alerting everyone about the incoming peril. 10 – Termites use chemical signals! It is proved that termites use pheromones as a chemical scent for communication between them and they leave a trail of scents to guide their workers using a special part of their body. Each different nest has a different scent, so they know if they are dealing with an outsider.